As a follow-up to this earlier post I think its important to note that I have discovered how to search the entire NIST library from AMDIS! It is odd but this doesn’t seem to be well described in the manual so maybe I can help other GC-MS ninjas to get the most out of their data by describing it here. The first thing you have to do after loading a results file, is to analyse it. 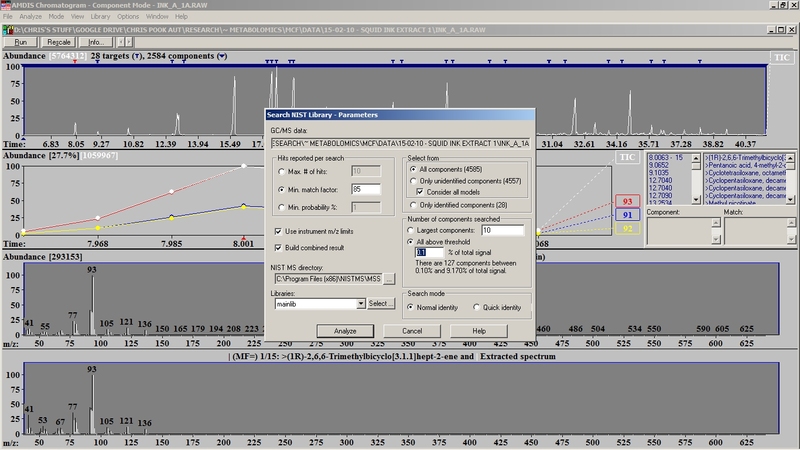 You don’t need to use any particular library to do this, you just need AMDIS to identify all the component scans in the sample. Any identities assigned to targets in this step will be overwritten in the following one. Next you have to select the “Search NIST Library…” option from the “Analyze” [sic] menu. This will give you a bunch of familiar options. If you haven’t set any reasonably stringent conditions in your earlier analysis step then you might want to specify a threshold to the intensity of the spectra it searches in the highlighted box in the image below. This will save you quite a lot of time. Just make sure you’ve got the mainlib selected in the drop-down box at the bottom left. I’ve tried this before and it just gave me an error message so I assumed it was a bug. Analytical software tends to be ridden with bugs and bits of it often just don’t work. As long as you try it on a file that’s already been analysed it will work though. 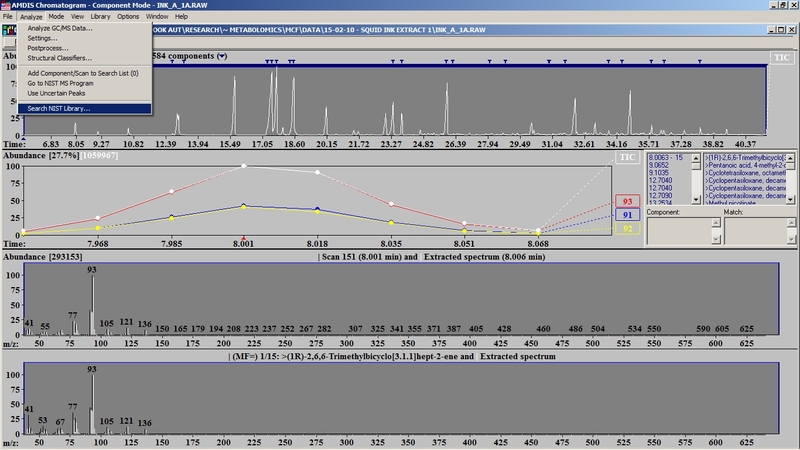 The output is exactly the same as that from any other AMDIS analysis. The only difference that I can see is that there is no way to automate this process,for batches of results files, unlike when using a custom library. At this stage I am prepared to accept this trade off for the extra hits you get from being able to exploit the ENTIRE NIST LIBRARY. You can see here that I’ve had identities returned for 57 targets, using the filters mentioned above. This particular sample is giant squid ink that has been derivatised with MCF*. 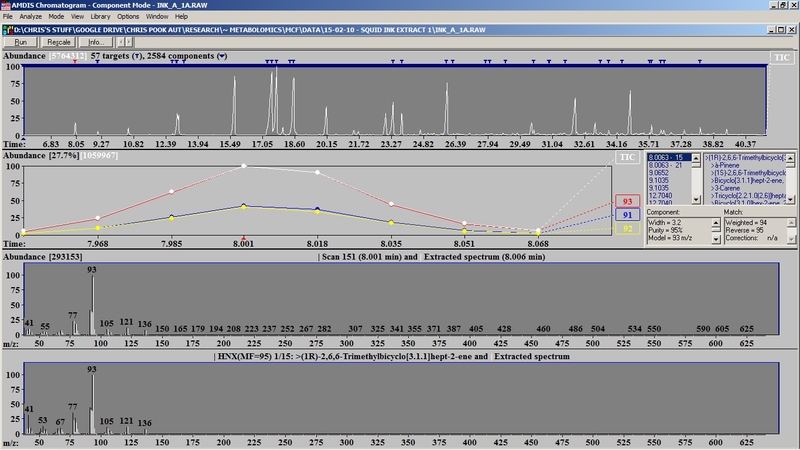 When I analyse it using the custom library for MCF derivatives I get 114 targets identified. This is pretty good for MCF derv, but when I use the full NIST library to search for matches for all 2592 components I get 192 target matches! I haven’t done any robust investigations of the accuracy of the full NIST results but they seem superficially relevant. I’m confident the results will at least compliment the MCF-specific results. Watch this space for more detail. Our new MPS autosampler at work derivatising amino acid standards with methyl chloroformate. You might want to turn your volume down because the phone was right next to the extractor fan for the trap. 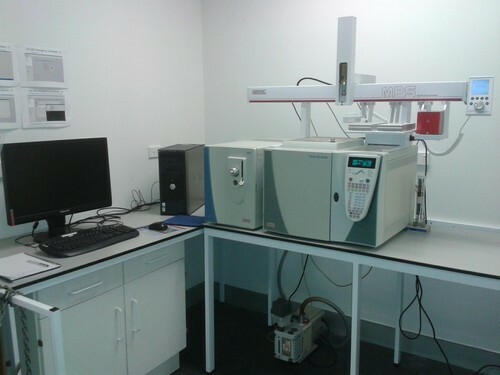 This is our venerable single quadrupole GC-MS (Gas chromatography–mass spectrometry). This is one of the two mass spectrometers we have, the other being the Agilent triple quadrupole LC-MS. It is a fairly standard instrument with the split/splitless injector and a 30 metre VF5-MS column. The recent acquisition of the Gerstel Multipurpose Sampler has given it an entire new lease of life, allowing us to perform sample preparation and automatic injection by headspace analysis, Solid Phase Micro Extraction (SPME) and conventional liquid injection. The instrument lives in an air-conditioned annex of my lab and is run from the PC next to it via Thermo Xcalibur v1.4 software and Gerstel’s Maestro software for the MPS. 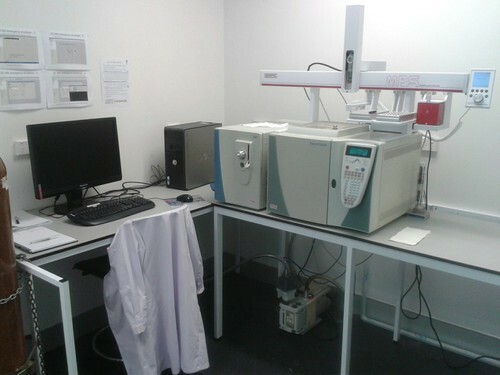 Current applications for this instrument include a research project into the function of terpenoids in plant immune response, the analysis of sugars in a wide variety of samples by acetylation for GC, profiling of volatile compounds in seaweed and metabolite profiling by methyl chloroformate derivatisation, by the method of Smart et al (1). In a moment of stunning brilliance on my part I managed to convince the school to purchase an autosampler for our Thermo GC-MS. This wasn’t actually that difficult once I’d pointed out that the $120,000 instrument was effectively unusable for research without one. After a lot of contemplation we opted for the Gerstel Multi-Purpose Sampler as this seemed to be the most flexible platform and wasn’t manufacturer-specific. This was an important consideration given the 10 year age of the GC-MS so if we upgraded to an Agilent GC-MS in the next few years <cough! cough! Hint, hint> then we’d be able to transfer it to the new instrument without issue. The MPS was installed about 6 weeks ago and has already injected more samples into the GC-MS than it saw in most of the previous year! Awesome is the power of automation! I cannot wait to set up some automated sample prep. I am really keen to try methyl chloroformate derivatisation for metabolite profiling of biogenic amines, organic acids and other small metabolites. Silas Villas-Boas of Auckland University School of Biological Sciences and his PhD student Sergey Tumanov very kindly shared their method (1) and library with me and I have been itching to try it out. Many thanks to Gerstel for a beautifully constructed and controlled instrument and also to Udo Rupprecht of Lasersan for doing the install and providing support. Here’s a picture of the beast. You can almost smell the barely contained analytical potential!